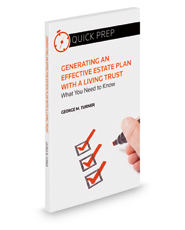 Written by an experienced attorney and lecturer, Generating an Effective Estate Plan with a Living Trust is a must-read reference for anyone managing an estate during their lifetime and ultimately planning for the distribution of assets. The book guides you through the benefits of generating a plan with a living trust, which can be used to solve potential challenges, such as issues of disability. This vital resource explains how you can ensure your desires are acted out with minimal administration and cost, achieving the best possible tax savings for your particular situation. From walking through the probate system to explaining essential documentation in a quality estate plan, the author covers all aspects of the estate planning process in easy-to-read, nonlegalese prose. Additional topics include examples of problems that can occur when the estate grows, methods of funding for death taxes, using an irrevocable trust, and working with attorneys and other professionals. With this essential title, you'll have all the information needed to create a plan in which loved ones are provided for in the way you intended.